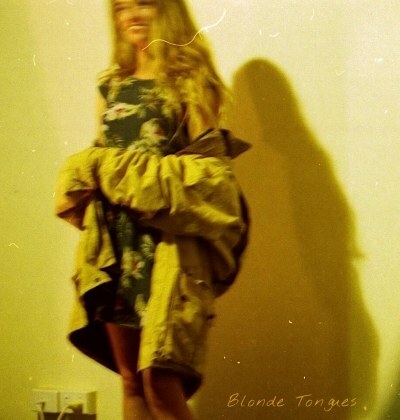 Blonde Tongues have been working on their sound for a little while, and the end result looks promising. Having seen this band play live, I know more or less what is to come and while their debut single, ‘Seilu’ was described as ‘sleepy’ on Mess+Noise, to me it sounds like the band are wide awake and are charging, soaring. “Wall of sound” is the first thing that comes to mind when thinking about the music Blonde Tongues create – it is as powerful as it is dreamy. ‘Seilu’ sweeps me up in its current and carries me to places. I get excited by storms, their approach and their convergence; ‘Seilu’ feels like the building of a storm, and I am tingling with anticipation. I know for a fact that things will only get louder, but there is gentleness in their approach to noise that is comforting. This song makes me wonder what it is like to fly through clouds and over foreign lands; there is an openness here that seems infinite, freeing. The shoegaze comparisons are largely appropriate, but at times this band raises their eyes upward, and that’s then their music soars. Their debut LP will be released independently. Also listen to the ‘Seilu’ B-side, ‘Beer’.